Welcome to OfficeClocks.com! We have a broad selection of world clocks, 24 hour clocks, calendar clocks and other time pieces. 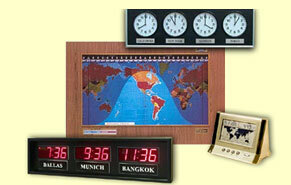 Most of our World Clocks can be custom made to fit your particular needs and decor. Our standard products can be ordered through our shopping cart, and our custom made items by calling our toll free number below. If you call during business hours, you won't get a menu or music - you will either get me, Garrett, or my voice mail. If you leave a message I will call you back ASAP. I return all calls. Please visit our testimonials page below to see what our customers have said over the past eighteen years about our products and service. We hope you enjoy your visit to our web site!